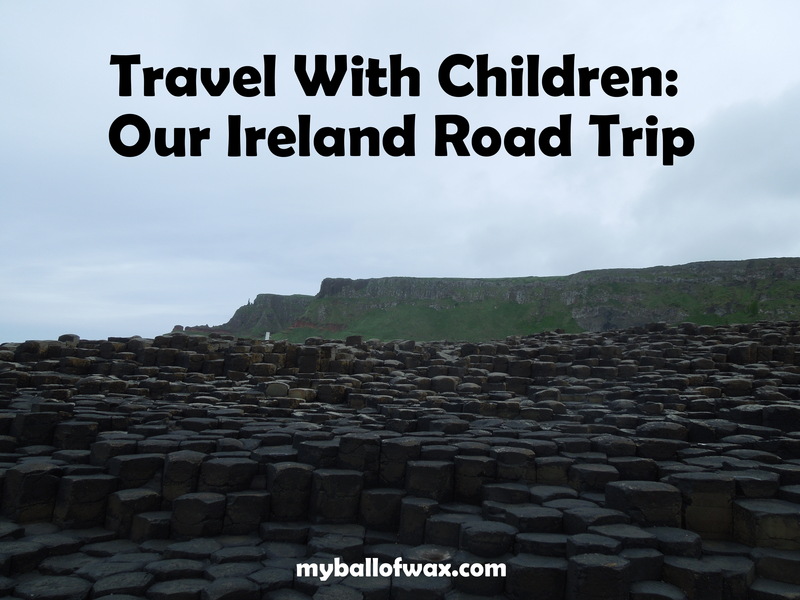 Road tripping…in Ireland…with children may seem like a scary vacation plan. Lucky for me, my kids travel well. But even if they didn’t, it is my opinion that there is just no better way to see a foreign country than to be all up in it-road trip style. So, we went for it, and it was the best vacation decision we could have made. Feel free to thoroughly read, skim, or even skip through to the parts of Ireland that interest you! Thank you for letting me share our journey with you! The goal was to drive around the country in somewhat of a circle, seeing as much of it in between as we possibly could. 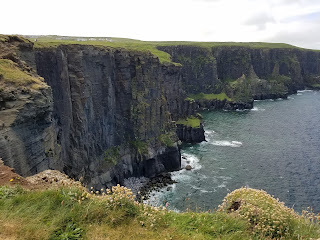 It’s not exactly an easy feat, but in only twelve days, we got to see an impressive amount of Ireland, picking out the destinations that interested us most, and only missing a few of the key attractions (Valentia Island, Rings of Kerry). 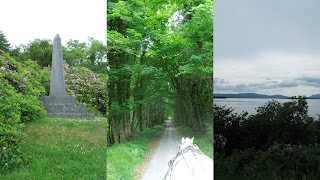 Based on our interests of castles, hiking and animal encounters, I went into planning mode. With all of the tools available on the internet, even planning a road trip to a country I’ve never visited was quite easy. With twelve days to explore, I planned a route around the country, which started at a castle in County Mayo and ended in the beautiful city of Dublin. For lodging, I intended to use sites like Kayak or Orbitz for our stays throughout the country. However, in Europe, rooms for a family of four aren’t as easy to find as they are in America. I noticed that when booking direct with a hotel, there were cheaper and more accommodating options. After booking our rooms, I purchased tickets online for as many attractions as possible to avoid waiting in lines. Once I was done with all of the fun stuff, I registered our family with the US Embassy in Dublin. Yes, I know…this might be a tad neurotic. But we live in an unfortunate time where terrorism is very real, and the 15 minutes it took to register our family gave me peace of mind throughout the trip. Of course, when you are road tripping, the first thing you need is a car. 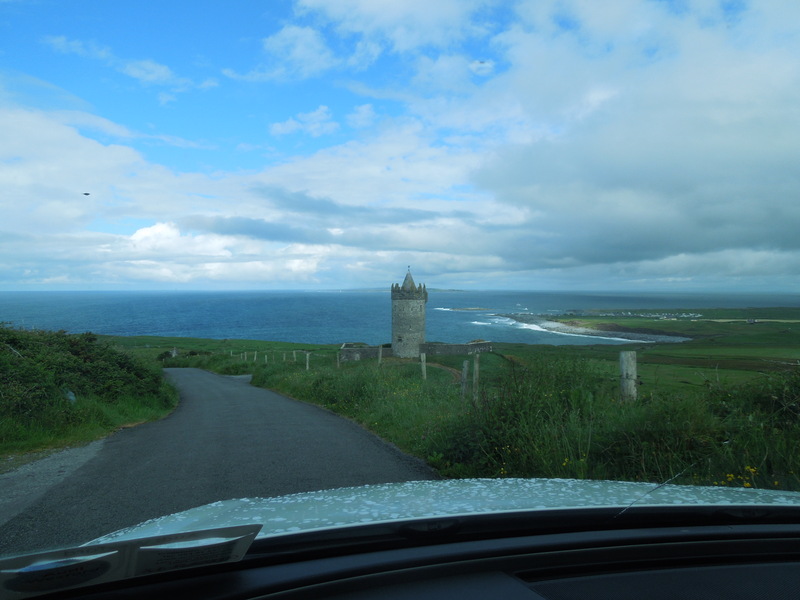 In researching car rentals in Ireland, there seemed to be much discrepancy about mandatory verses optional insurance. Even though I always book my car with my American Express card, they unfortunately did not cover the type of insurance needed in Ireland. So, instead of dizzying my brain with the rules of insurance, I found a miraculous website that takes care of the headache. Easy Tour Ireland (http://www.easytourireland.com/) offers all-inclusive insurance - third party, theft, collision, damage, personal and even the super insurance. Easy Tour partners with the well-known Hertz rental car company. Although they did not offer as many car choices as some of the other rental companies, the prices were competitive. And the best part? I knew I wouldn’t be harassed by a sales person to buy extra car insurance. I wound up renting an Audi with GPS system for roughly $1200 for twelve days. Not bad. *Tip 1- I printed out some Google maps to get us to our destinations in case our GPS wasn’t accurate, but this was unnecessary. Although the GPS sometimes had a mind of its own and decided to take some unconventional routes, we always arrived at our destinations. *Tip 3- Driving on the wrong side of the road on the wrong side of the car can take some time to get used to. In addition to driving this way, Ireland loves its roundabouts. So, make sure you are prepared for them! 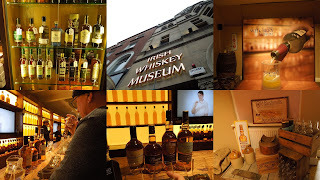 Once our plane landed in Dublin, our road trip began. 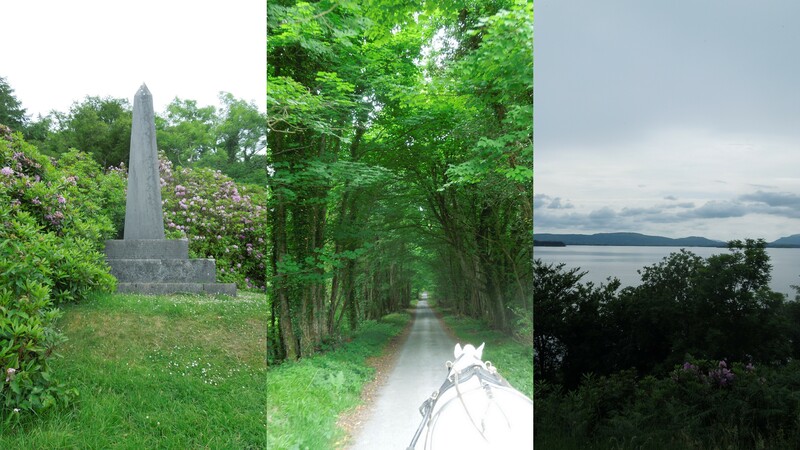 Our first destination was three hours away in the County of Mayo. Luckily, our car rental pickup went smoothly and we were out of the airport and on our way within an hour of landing. 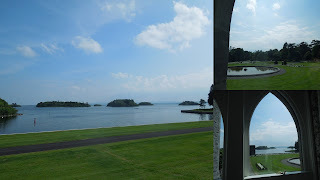 What this grand estate offered was incomparable to all of the hotel experiences I’ve had throughout my lifetime. Upon driving onto the property, we were all in awe. From the regal entrance to the friendly staff, check-in was stress-free and pleasant. 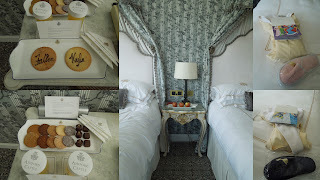 Upon entering our corner room with amazing views of the grounds and lake, we were greeted with chocolates, monogrammed cookies for the girls, freshly squeezed apple juice, fresh apples, water, robes, slippers and personalized stories for each of the girls. We truly felt like royalty. We had an early dinner at The Drawing Room, where my girls chose from a children’s a la carte menu, featuring items like roast chicken, mac n cheese and buttered pasta. As for the grown-ups, we played it safe with French dip sandwiches. The food was decent, but the view overlooking the grounds was amazing. 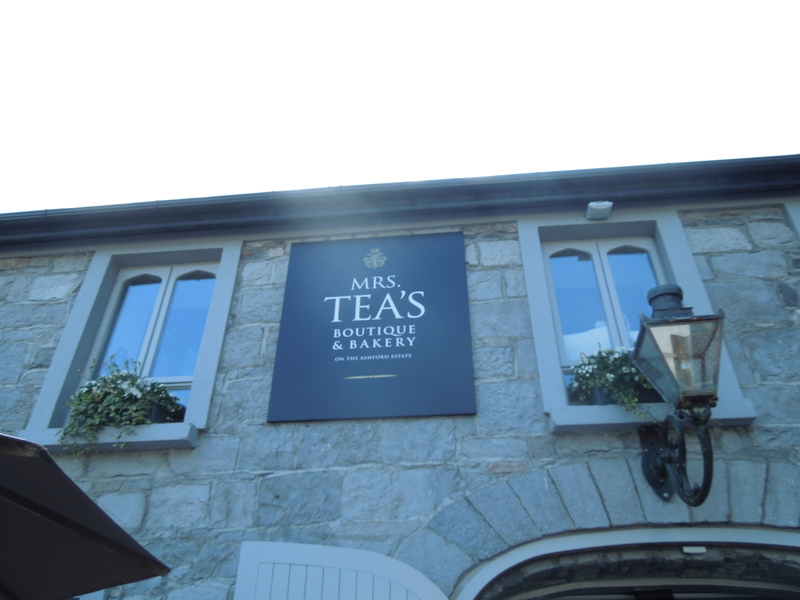 After dinner, we opted to check out Mrs. Tea’s Boutique and Bakery, which is a souvenir and snack shop. 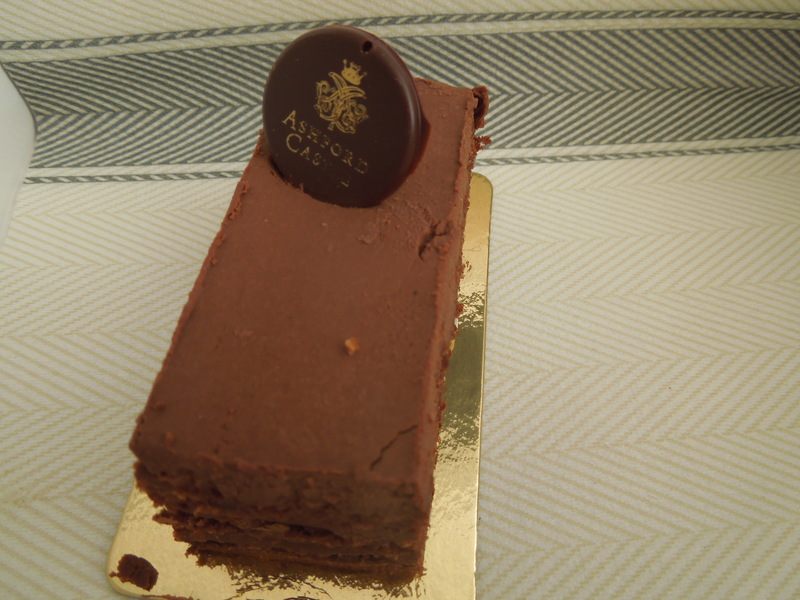 We all chose to bring chocolate torte desserts back to our room, which turned out to be unnecessary, as when we returned, small boxes of chocolate were left on our beds as part of the turn down service. 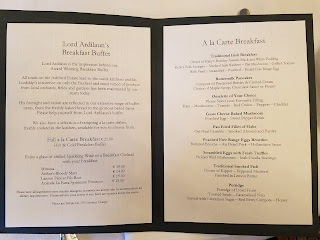 We started our morning at the George V Dining Room for a great breakfast buffet, which also included an a la carte menu. The pancakes were so good, we ordered seconds! The staff were extremely attentive, accommodating and friendly. After breakfast, we walked toward the Falconry School for our 10am Hawk Walk. 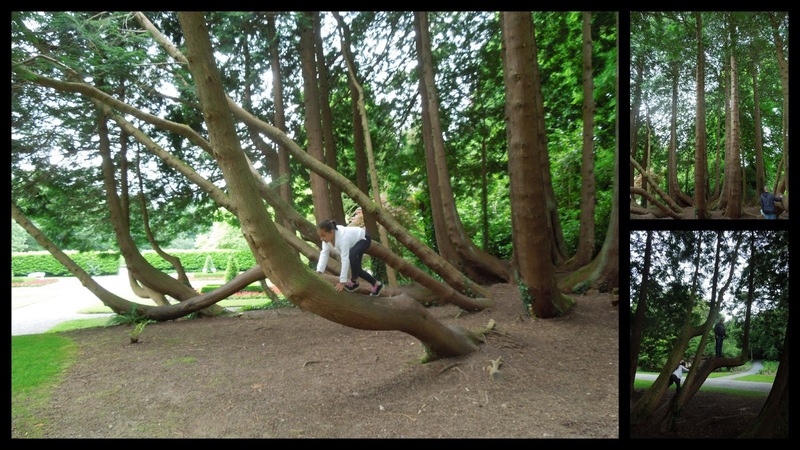 However, on the way, we came across these magnificent trees and decided some tree climbing was in order. 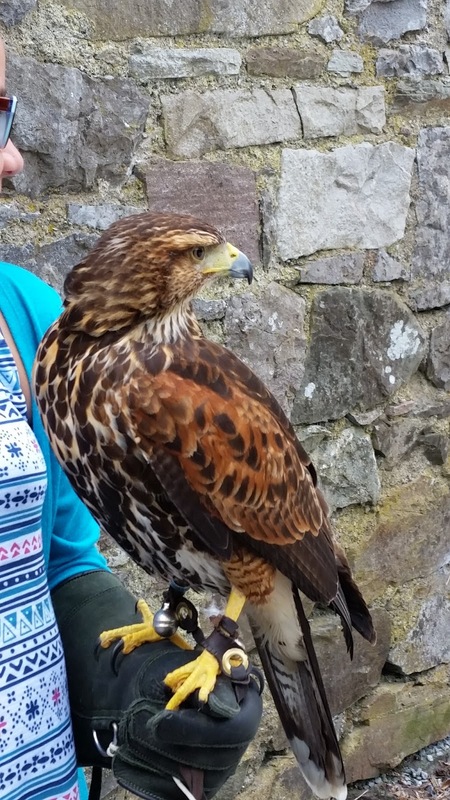 At 10am, we were introduced to our hawk, Lima. As we all followed Lima through the woods, hoping she wouldn’t get lost, we were quite amazed at how she would eventually come back to us every time. Our walk with her lasted about an hour, and we each got plenty of time with her. 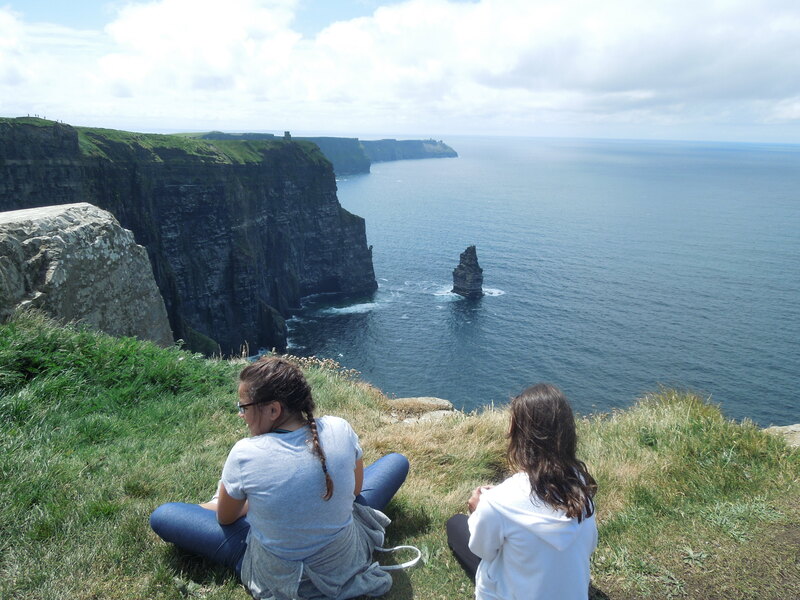 This was one of our favorite experiences in Ireland! Next, we explored the castle grounds, played some tennis, and went back to Mrs. Tea’s for a delicious cookie snack before our carriage ride at The Equestrian Center. 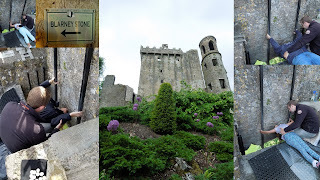 At 4pm, Bramble the horse took us for a 45 minute ride, exploring the castle grounds, where we learned some history about the Guinness family (who once owned the castle). 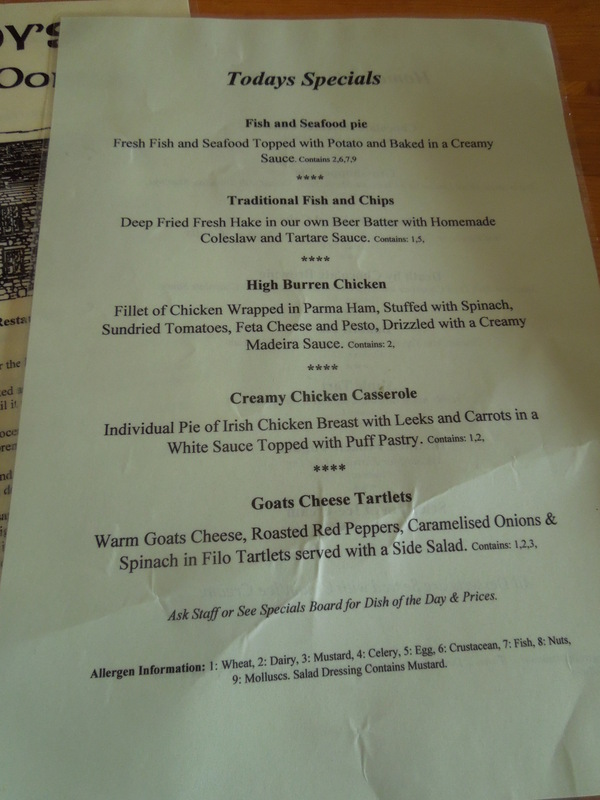 For dinner, we tried Cullens at the Cottage. I would recommend the parmesan herb chicken and the brownie sundae for dessert! Before bed, my girls wanted to play a game of chess. 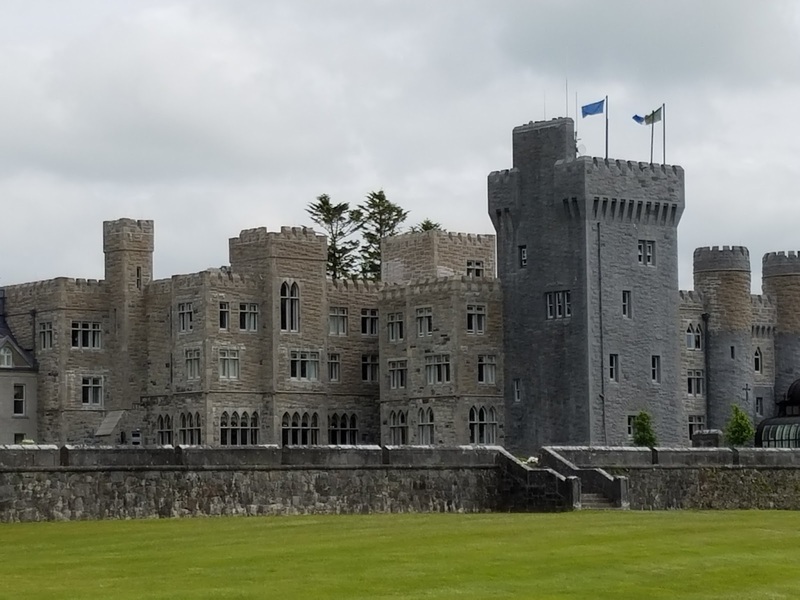 So, my husband and I sat by the fire and watched them play, all the while wishing that we had more time at this wonderful castle! Because our GPS decided to bring us to the Aran Island Ferry office in Galway instead of to the actual ferry terminal in Rossaveal, we missed our 10am boat to the Aran Islands. So, we decided to make the best of it and booked a ticket for the afternoon ferry to Inis Mor. We didn’t have as much time as I wanted, but at least we were able to see it. We had some time to kill before the bus ride to the ferry station, so we went to Café Esquires in Galway which had amazing pastries and the biggest cup of hot cocoa my daughter could have ever dreamed of! 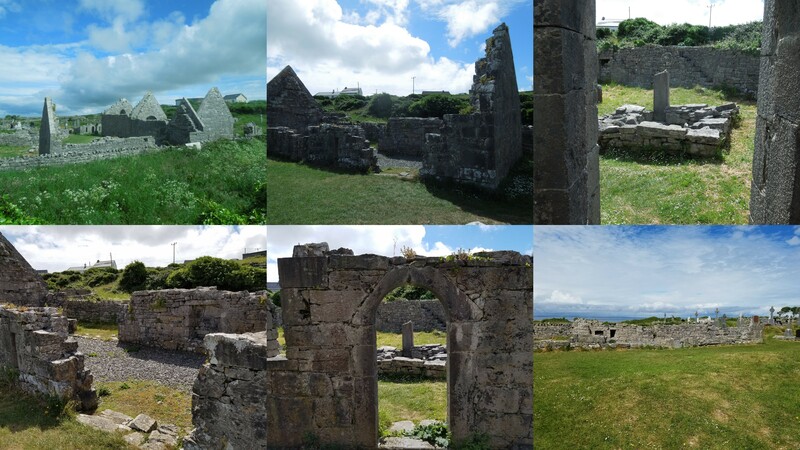 *Tip- I would recommend using the bathrooms either on the ferry or at the terminal before your trek around Inis Mor. As soon as we stepped foot on the island, there were a variety of hired options for island tours. 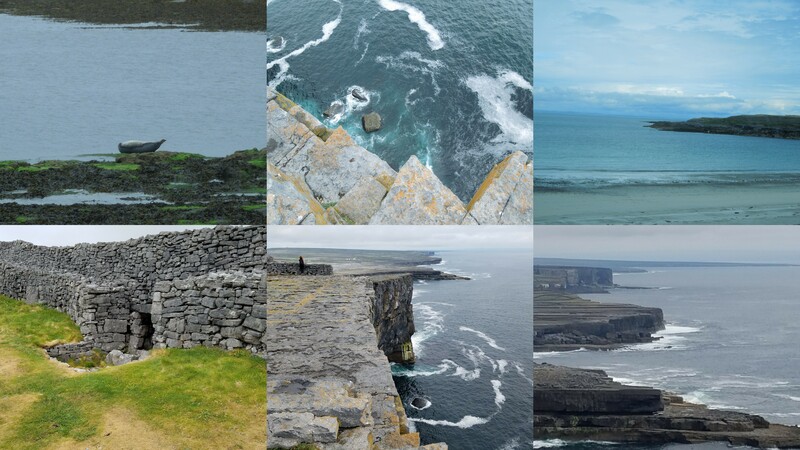 On my list of things to do were the wormhole, the seals, Kilmurvey Beach, Aran Island sweater shopping, and if we had time, the fort (Dun Aengus). Because we got a late start, we wound up hiring a driver for 30 Euro to take us on a guided tour to see the seals, Kilmurvey Beach, Dun Aengus and the Seven Churches. Because I’ve been to my fair share of forts in my lifetime, I wasn’t excited to see Dun Aengus. 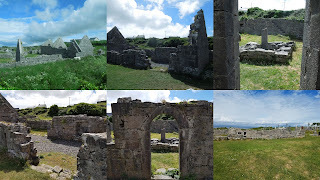 But of everything we saw on Inis Mor, Dun Aengus was my favorite part. 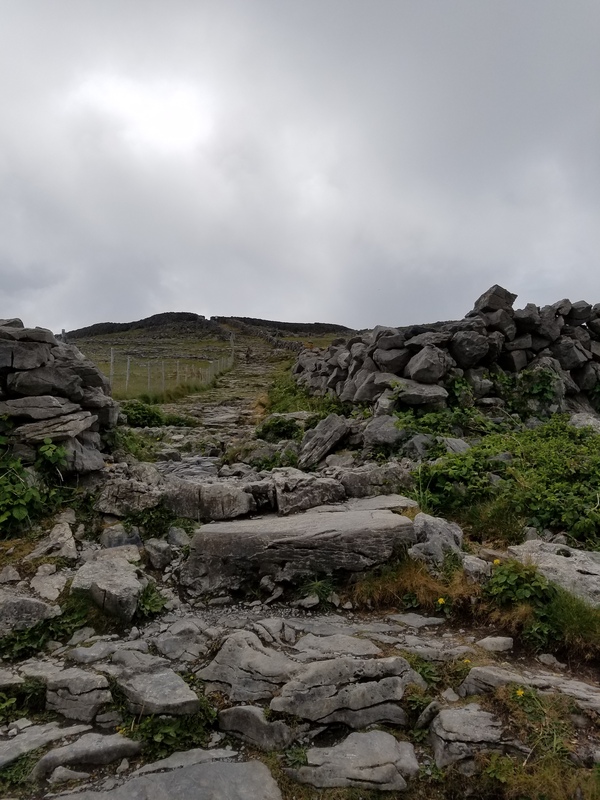 With the challenging rocky path to get to the top, the barrier-less summit and the panoramic views, I would say that this is a must-see when coming to the Aran Islands. *Tip 1-Wear sneakers or hiking boots! 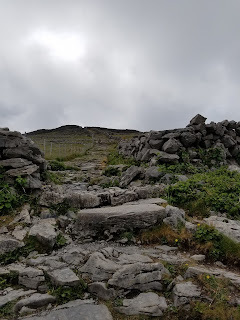 The pathway to Dun Aengus is very rocky (see trail below)! 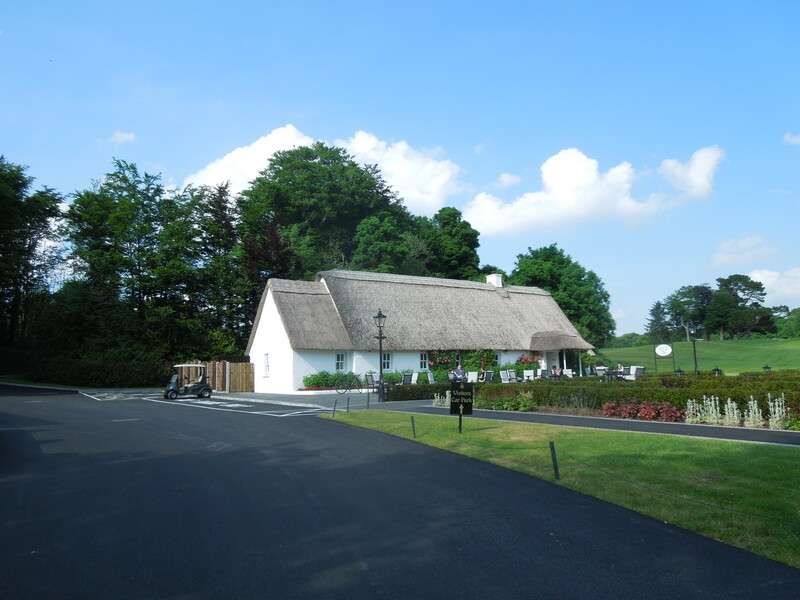 *Tip 2-Bathrooms and a small café are conveniently located before entering the visitor’s center. 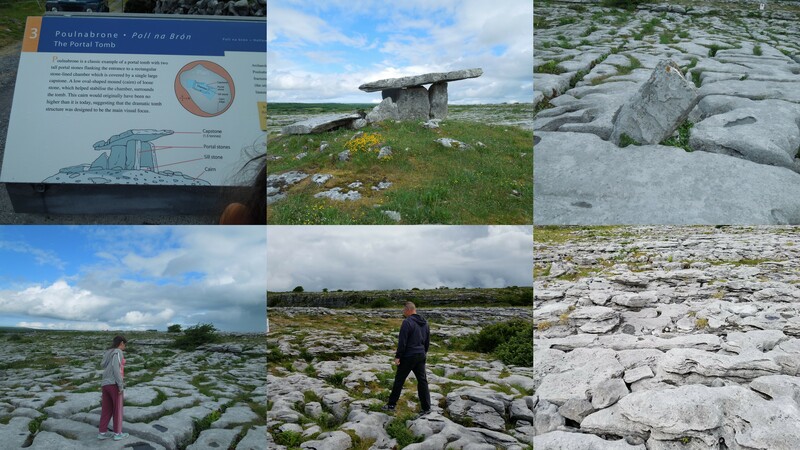 *Tip 3-After descending Dun Aengus, we had some time left for shopping before our driver picked us up. 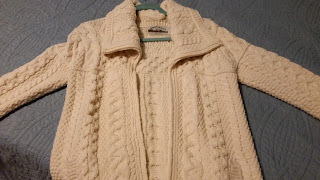 One tip our driver gave us was to buy Aran Island sweaters from the shops near the fort, as the sweaters from the enormous tourist trap that is the Aran Island Sweater Market are not authentic and are made in China. I don’t know if that is the truth, but I have to say that I am glad I waited to get to the fort to do some shopping. 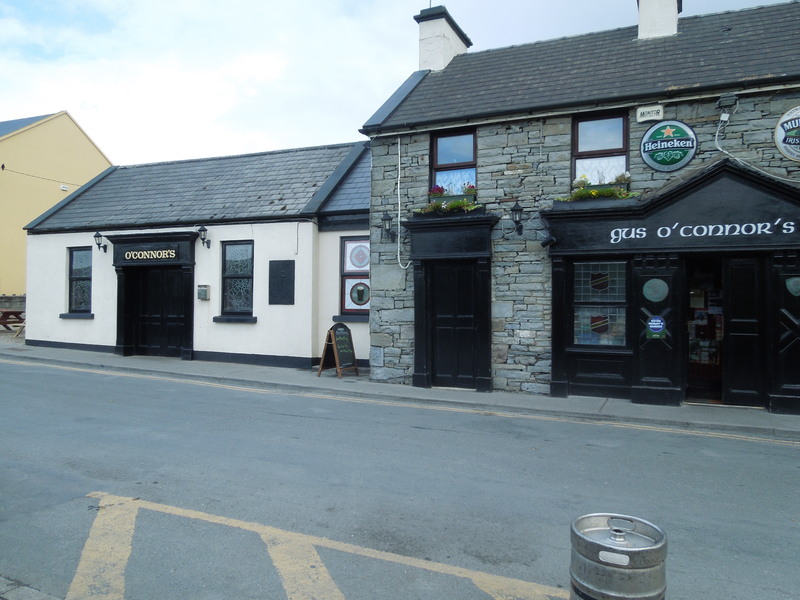 As I entered some of these shops, there were women knitting the famous Aran Island sweaters right before my eyes. The shops also offered an array of hand crafted jewelry, soaps, and scarves for sale, all made by artists who actually live on the island. 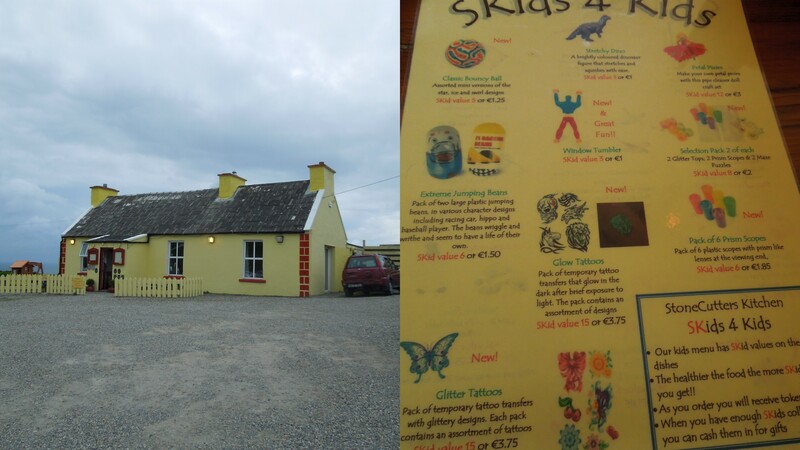 I would highly recommended supporting local business by resisting the temptation to shop anywhere else for Aran Island souvenirs. On our way back to the ferry, we had some time to stop at the Seven Churches, one of the earliest Irish pilgrimage sites. Though it looked to be more of an ancient graveyard, it was still nice to spend a moment viewing the ruins. 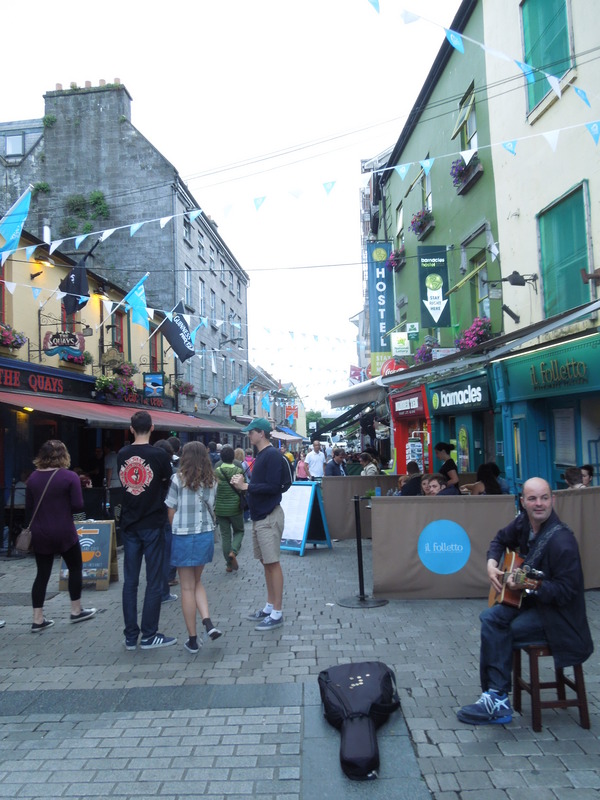 After our day on the islands, we checked into the Jury’s Inn Hotel in Galway, ate at the Jury’s Inn pub and quickly toured Kirwan’s Lane, which included pubs, restaurants and shops. *Tip- The Jury’s Inn hotel was our least favorite hotel, with rude staff, no a/c, and a room (#213) which overlooked a very noisy courtyard. While the location is fantastic, I would recommend this hotel for younger singles, rather than travelers with children. Our fifth day started with an early drive to the Caherconnell Stone Fort for a sheepdog demonstration. We arrived too early for the 10am demo, and were lucky enough to tag along with an incoming 9:10am tour group. *Tip-There is a café with bathrooms on site. 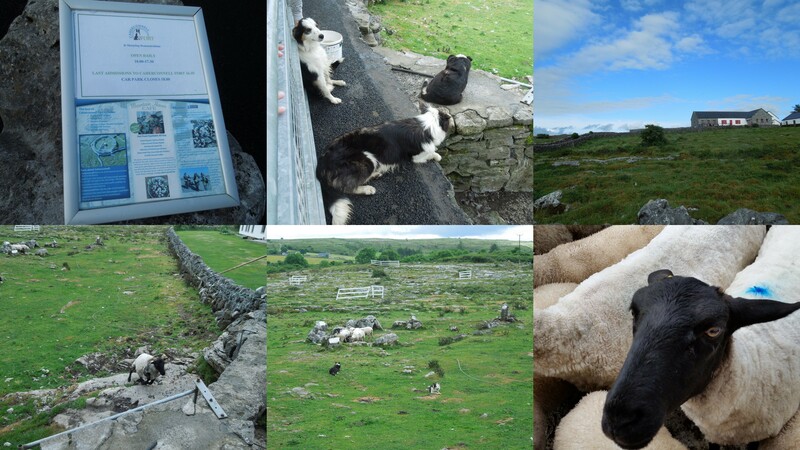 The demo was fun and informative (we learned that it takes 3 years to train the dogs to herd the sheep). 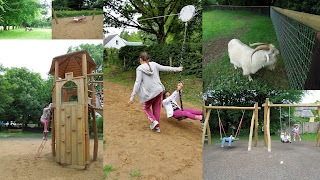 One of my daughters even got to try out her sheep herding skills by calling out to the border collies, Lynn & Leo. We were really amazed at how smart these dogs were! 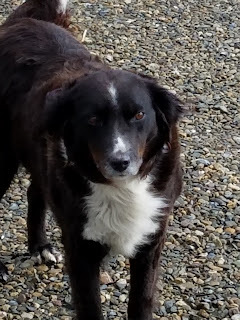 During one part of the demonstration, John, the landowner, asked the dog to bring only 2 of the 10 sheep that were in the herd, and the dog did it! Although this might not be a typical Ireland attraction, I would highly recommend adding it to your list of things to do if you are traveling to County Clare! After the demo, we drove a few minutes down the road to a memorial tomb called Poulnabrone, which slightly resembles Stonehenge. 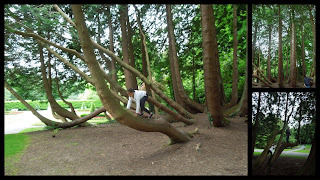 My girls loved skipping from stone to stone on the grounds, which were made of limestone. *Tip-See everything…even the “boring” stuff! It’s funny that throughout this trip, what I thought my girls would find boring usually turned out to be more fun for them than I expected! Who knew that skipping over stones would be the highlight of their day!?! Being that we had a light breakfast, we were ready for lunch…only Cassidy’s Pub (a pub I mapped out prior to our trip) didn’t open for another 40 minutes. 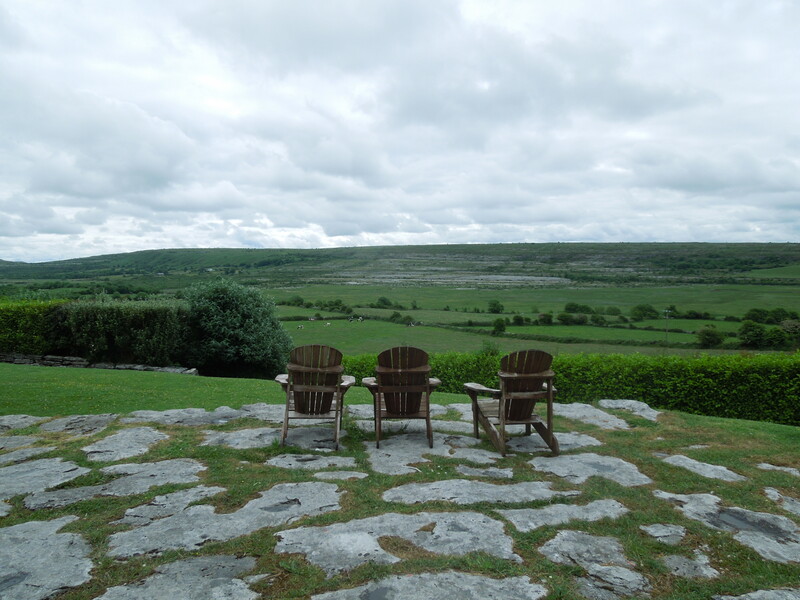 So, we arrived at the small cottage that is Cassidy’s Pub and lucky for us, the views from the back were breathtaking. And to top it all off, there were adirondack chairs set up, which were perfect for some family reading. 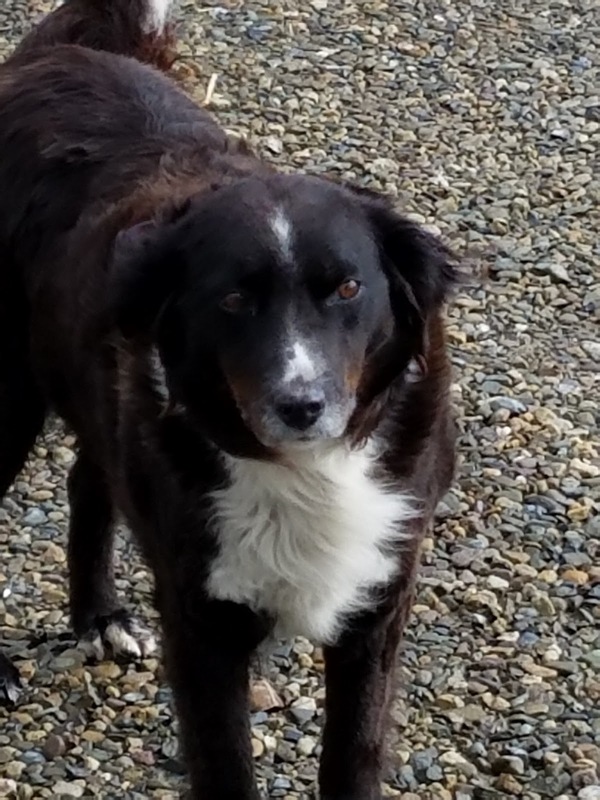 And while we were reading and appreciating our view (and our down time), a stray border collie came looking for some love, so my daughters we were in heaven, petting him and enjoying his company until the pub opened. Most of the time, you see pics of people reading on a beach with painted toe nails. Instead of painted toes in the sand, this is me reading…in my boots…with the greatest view ever. To our delight, Cassidy’s food and hospitality was fantastic! The fish and chips, spaghetti Bolognese, death by chocolate brownie and the grasshopper pie are some of the dishes we liked best. In addition, the menu had a unique way of describing which allergens were in each dish, which I thought was a really nice feature for families with allergy concerns. 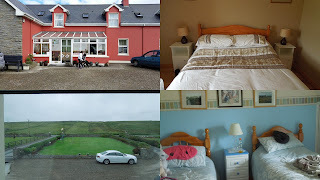 After our lunch, we headed to the Doonagore Farmhouse Bed and Breakfast, owned by Pat and Mary Sweeney, which is where we would be staying for the next two days. Upon arrival, we were greeted by Daisy the dog, which delighted my girls! And then we were welcomed by a smiling Mary. The rooms had a rustic charm and beautiful views. It felt like our home, rather than another night at a hotel. We woke up early for breakfast, which is served from 8-9:30am. 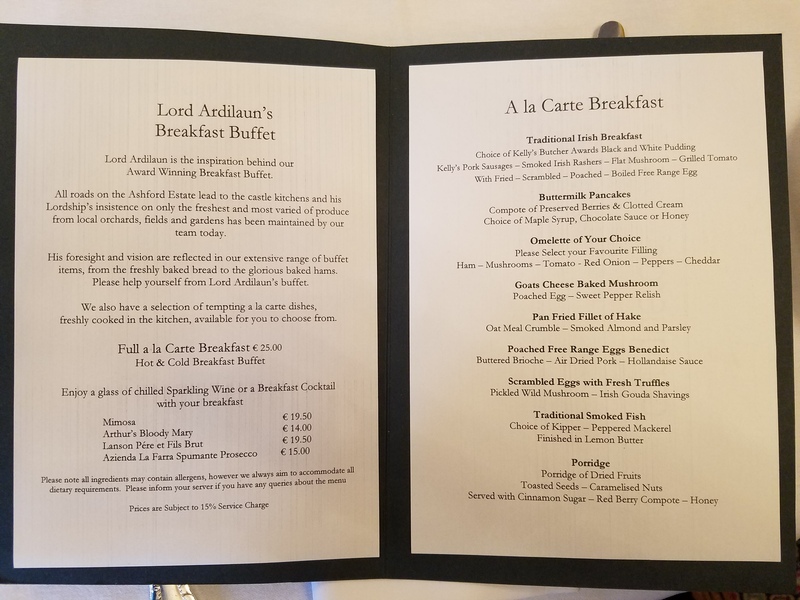 Without a doubt, during our two week stay in Ireland, this won the award for best breakfast! Everything from the eggs to that delicious Irish bacon was so tasty and fueled us up for our 10am hike. Included with our stay at the farmhouse was a 5 mile Cliffs of Moher hike with Pat Sweeney. The trails were created by Pat over a period of ten years. And though they still aren’t 100% completed, it was the hike of a lifetime. 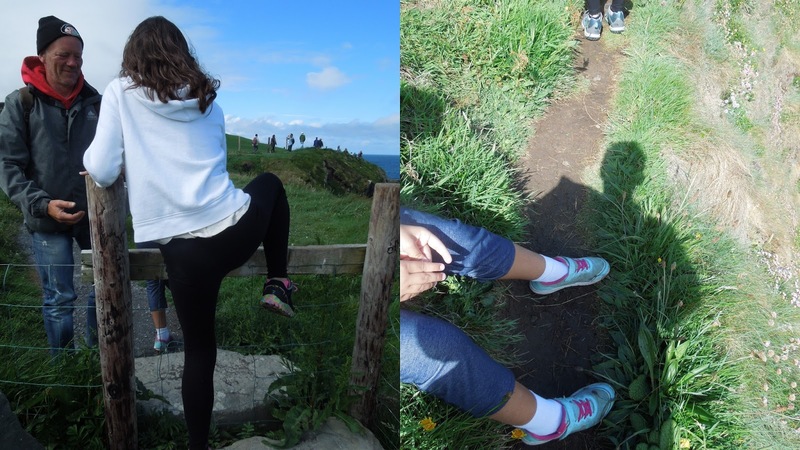 In my opinion, this is the only real way to experience the Cliffs of Moher. Not only did we get to stand on the edges with no barriers, we also learned so much history from Pat. It was clear that he loves his country and is proud of what he has accomplished. 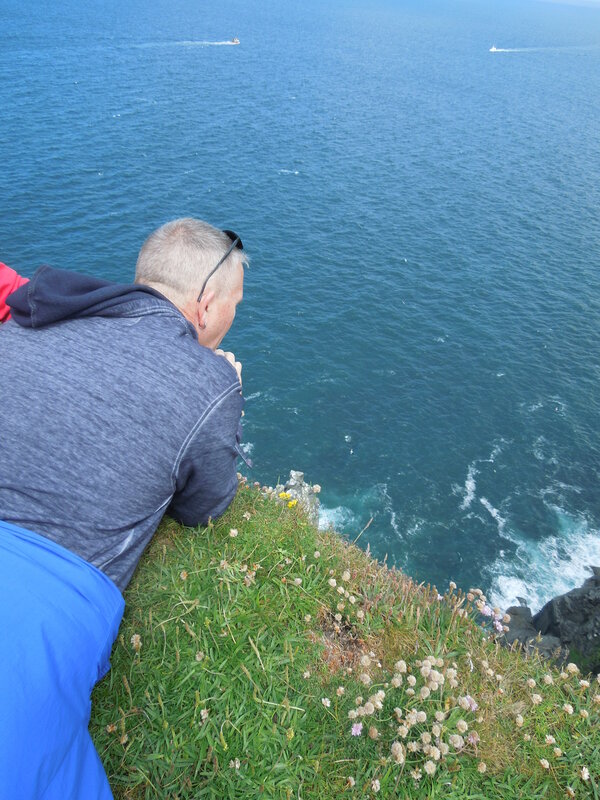 I would highly recommend taking Pat’s tour of the Cliffs of Moher. *Tip-It is a very narrow trail and sometimes rocky terrain, with some steep hills to climb and fences to hurdle over, but my 8 and 11 year olds handled it just fine. Make sure to bring plenty of water, snacks, sunscreen and some good sneakers or hiking boots. *Tip 2-There are no bathrooms on this trail, so make sure you go before it starts. There are bathrooms at the endpoint, which is the visitor’s center, but keep in mind that it is roughly a three hour hike. When we finished the hike, we had about 30 minutes to peruse the Visitors Center, which housed some interesting exhibits. But nothing could come close to what we just accomplished. I almost felt bad for the people who were coming to the Cliffs through the Visitor’s Center, as I knew their view would pale in comparison to our experience. 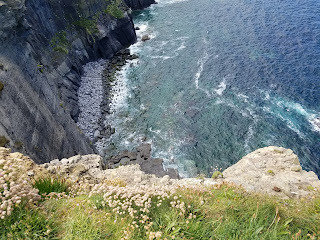 When our time was up, we took a bus back to our original meeting spot, O’Connor's pub in Doolin, where we found a local chocolate shop and treated ourselves for a hike well done. We also stopped for snacks, drinks and souvenirs before heading back to the farmhouse. We rested for the remainder of the day and decided on an early dinner at a restaurant down the road called Stonecutters Kitchen. I would recommend the stew! The restaurant has a unique program called Skids, where kids get tokens for choosing healthy items, eating all of their dinner, and displaying good dinnertime behavior. At the end of the night, they could cash in their tokens for prizes. So, my girls left with full bellies, prizes and smiles on their faces. 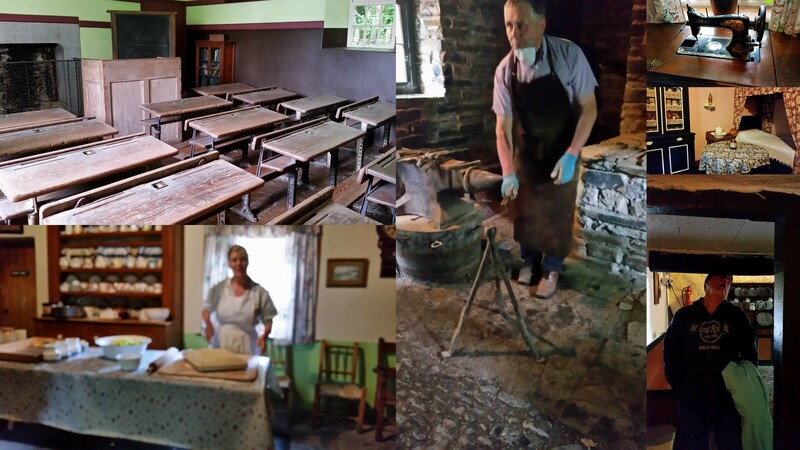 After our final breakfast at the farmhouse, we headed to Bunratty Castle and Folk Park, where we learned Irish history and observed how the Irish lived in the 1800s. 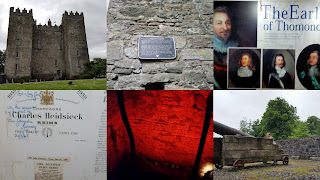 We saw a blacksmith heating horseshoes, women making apple pies (which were sold next door in the café), an old school house, a dungeon, and of course, the Bunratty Castle. 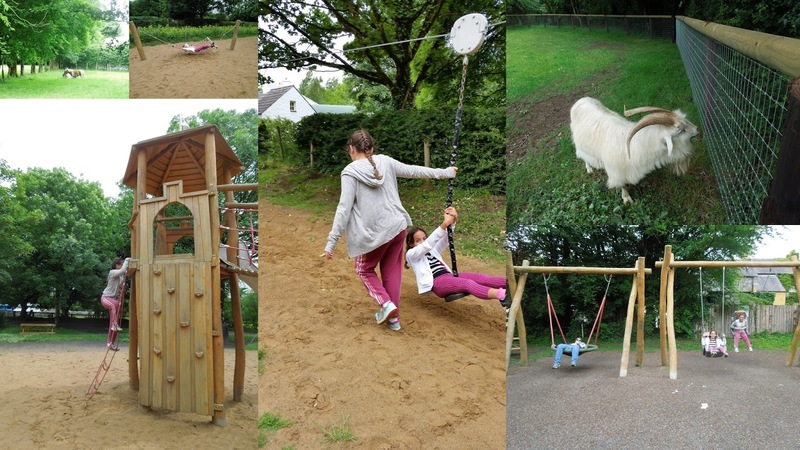 We also explored the exquisite gardens, which included farm animals like goats and pigs, and the girls played on the spacious playground. 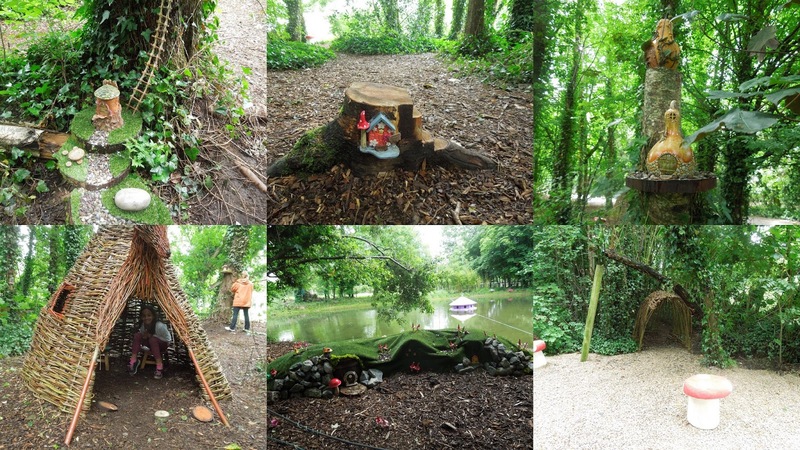 I’d have to say my favorite part of the park was the fairy garden! 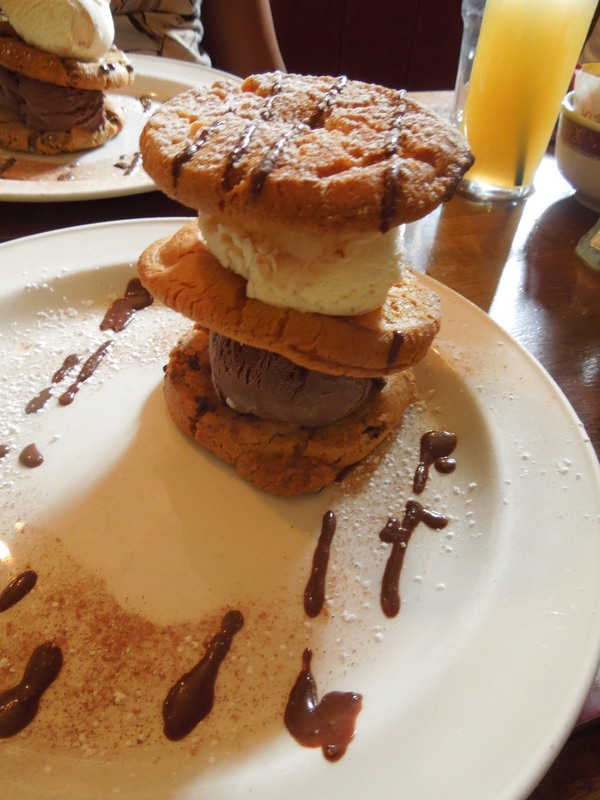 After a great family day at the park, we had an early dinner at The Creamery Bar, which served bar food and scrumptious desserts like the chocolate chip cookie tower! 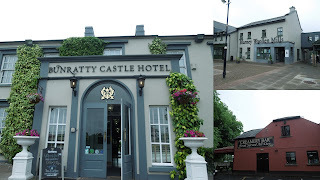 Then we did some shopping at Blarney Woolen Mills before checking into the pretty and conveniently located Bunratty Castle Hotel. 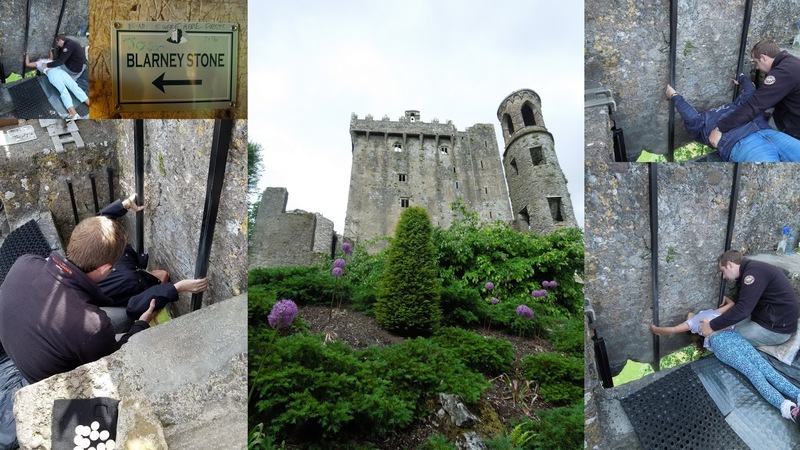 Our next stop on the trip was to the infamous Blarney Stone. My girls were not looking forward to this because they are both a bit germaphobic. But they did it! 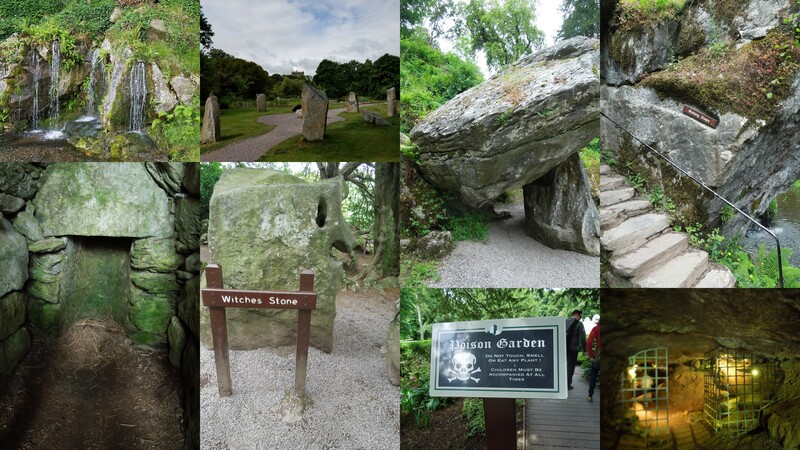 I was surprised to find that there was so much more than simply kissing a stone and going home. In addition to the Blarney Stone Castle, we explored the Rock Close, where we found the Poison Garden, Witch’s Stone, Witch’s Kitchen, Wishing Steps and Fairy Glade. 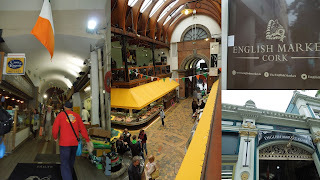 After the Blarney Stone, we drove into the city of Cork and went to the English Market. We ate lunch at The Farmgate Café, which is a busy deli type restaurant, overlooking the market, which serves local market food. We had cheddar and ham herb grilled sandwiches and we stopped at a few stalls for desserts (cookies, brownies, cake) to bring back to our room to eat later. 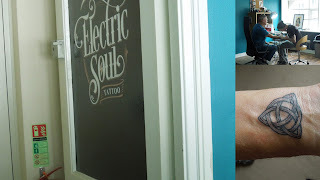 Before heading to our bed and breakfast, my husband decided to memorialize the trip permanently…on his skin… at the Electric Soul Tattoo Shop. Inked and hungry, we checked in at The White House Bed and Breakfast, which was absolutely the nicest room we’ve stayed in since the Ashford Castle experience. 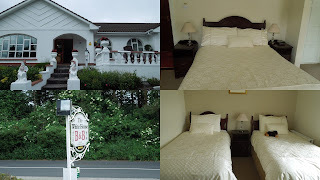 It was spotless, roomy, comfortably elegant and only a 5 minute walk to Blarney Village. 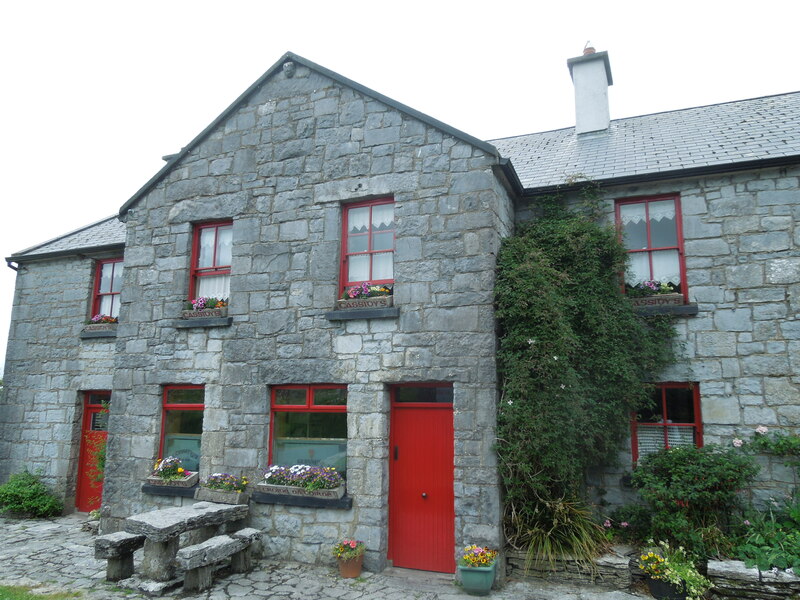 In addition, the owner, Pat, was the nicest person we met in Ireland (and almost everyone we met was insanely nice)! He was welcoming and personable and accommodating. He felt like an old family friend. 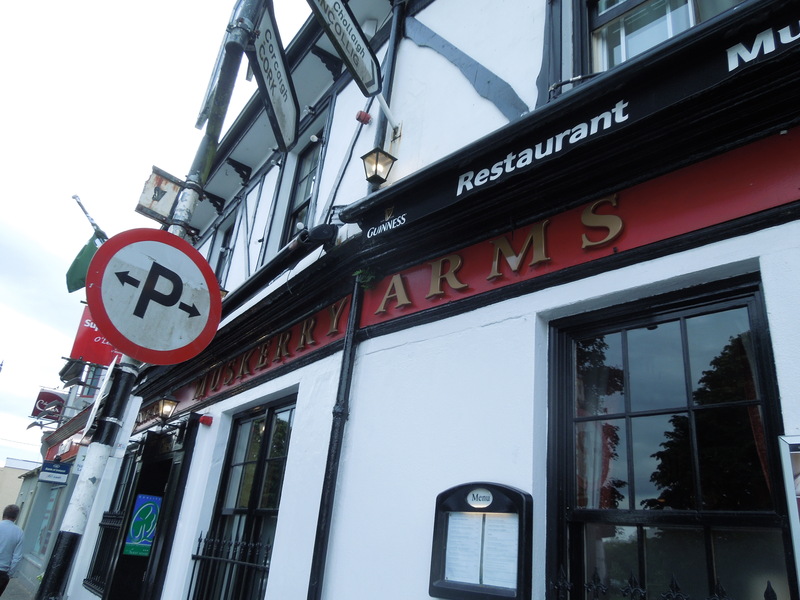 Based on one of Pat’s suggestions, we went to the Muskerry Arms for dinner for some pub food and local music. We were lucky to enjoy a fantastic musician by the name of Kieran O’Leary. He really made our night special and even though it was known as a touristy pub, I still felt like a local. We woke for breakfast at The White House and were greeted warmly by Regina and Pat. The breakfast was delicious, and our stay was perfectly enjoyable. But it was time to press onward to the House of Waterford Crystal. 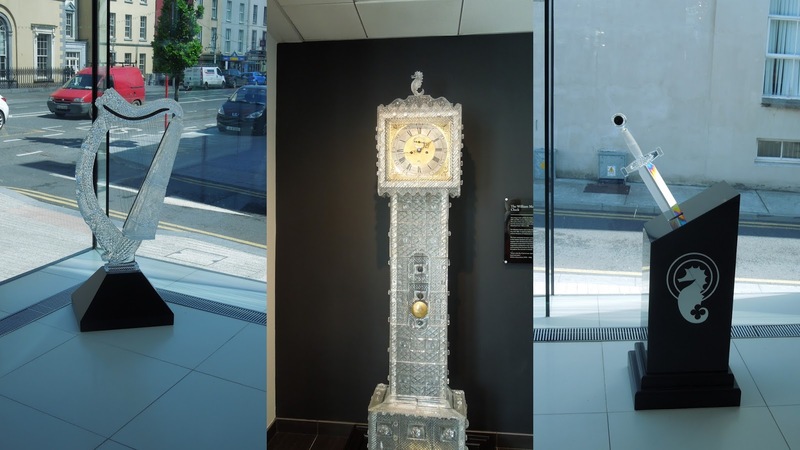 Entering the showroom at Waterford filled me with awe…and anxiety. 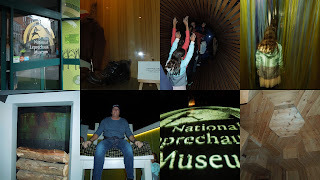 Though my girls are old enough to know not to touch anything in places like this, traipsing around the displays, some of which cost thousands of dollars, made me a little nervous. 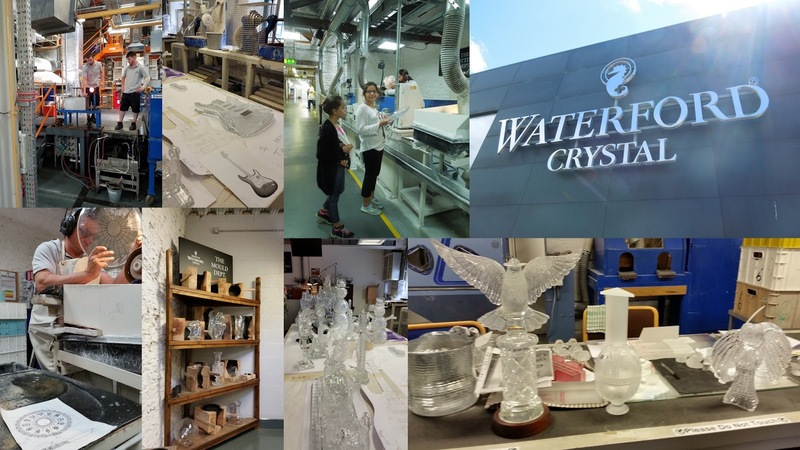 But soon, it was time for our factory tour, where we got up close and personal with the employees who create this beautiful crystal for Waterford, all while learning some interesting crystal facts. One of the workers even stopped what he was doing to let my girls hold the piece he was working on! Yikes! The tour lasted about an hour and was the highlight of the day, so I would definitely recommend it if you visit the Waterford area. If you follow my travel related posts, you know that our plant shelf at home is not filled with plants, but instead, filled with memorabilia from our family travels. 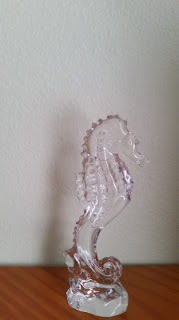 So, we picked out a Waterford seahorse to add to our plant shelf collection. We had a bite to eat at the Waterford Crystal café and drove onward to our final destination on the road trip – Dublin. We arrived at the Trinity City Hotel in the late afternoon, handing over the keys for the last time to our valet. *Tip-Valet service is available for 20 Euro per night and is completely worth it, as the city is busy and has limited parking. When walking into the purple entryway of the hotel, I couldn’t help but wonder if the designer was a huge Prince fan. 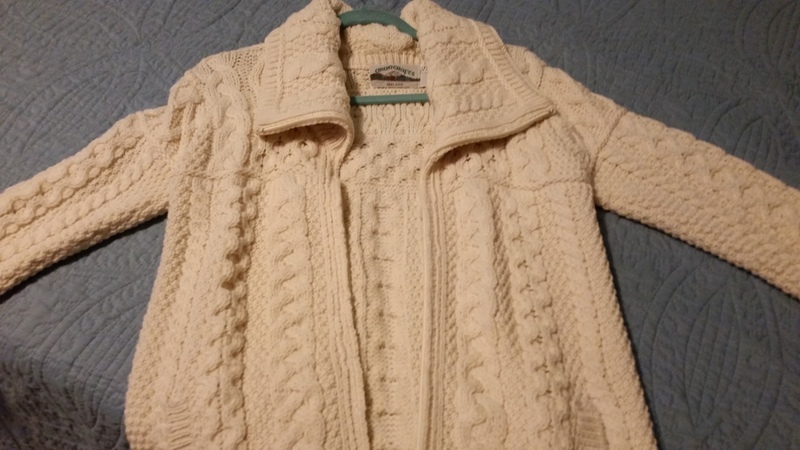 It was flashy, but in an upscale way. 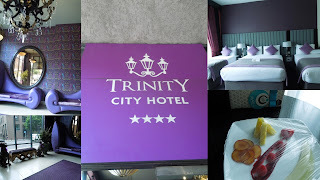 The room had that same quirky but cool vibe, and we were greeted with a fresh fruit plate and a box of Lily O’Brien chocolates. 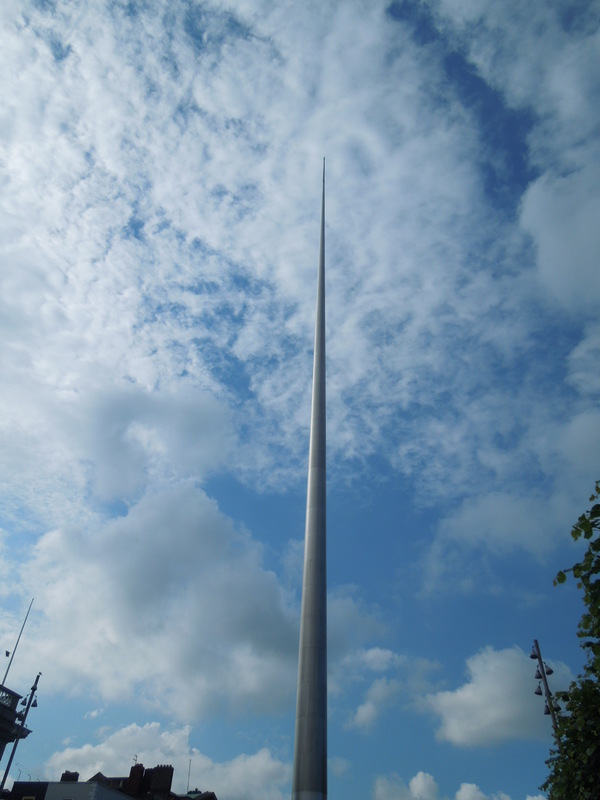 After resting for a moment, we took a walk to O’Connell Street to see the Spire, and then we got dinner at Thunder Road (similar to Fridays in the US, but with a motorcycle motif). We decided to call it a night because we had a very early morning ahead. This was the only day we got to experience the infamous Ireland rainfall (and the weather was colder, in the low 50s, in Northern Ireland). But luckily, the rain stopped when we reached our destination. I’m not usually a bus tour type of traveler, but it seemed like the only sane way to see Northern Ireland. 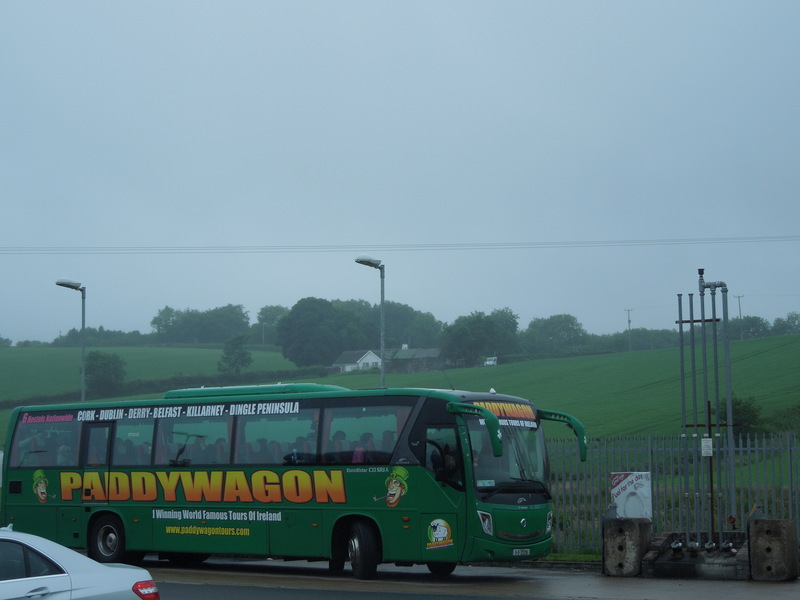 So, we boarded a Paddywagon bus at 7:30am for a full day excursion. Unfortunately, our bus had an issue with a windshield wiper, so we had to stop at a rest stop for over an hour to wait for a new bus. This was a bit frustrating, but only one person complained (and of course, she was American). 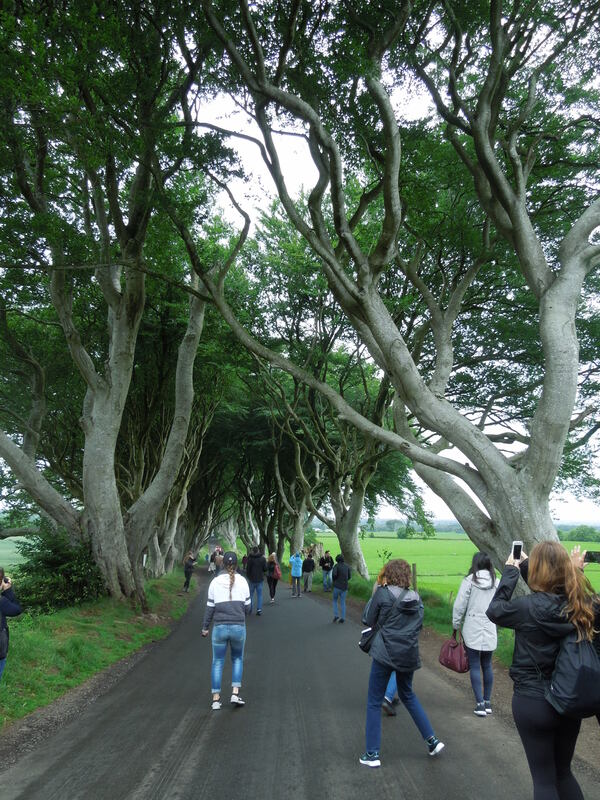 Once we were back on our way, our first stop was the Dark Hedges, a beech tree tunnel planted by the Stuart family in the 18th Century, or better known today as a place where The Game of Thrones is filmed. Being that I’m not a Game of Thrones fan, this spot had no significance to me. However, the street enclosed by beech trees was certainly pretty. Our next stop was the rope bridge, Carrick-a-Rede. 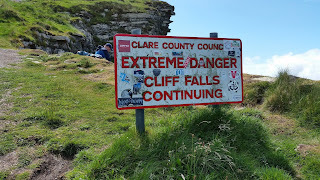 After our much more dangerous experiences at Dun Aengus and the Cliffs of Moher, this rope bridge was not as challenging. But there was something still very Indiana Jones-ish about crossing a shaking bridge made out of rope. 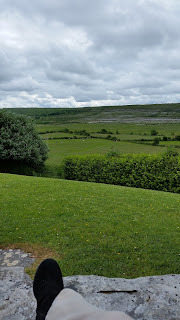 And the views, like everywhere in Ireland, were spectacular. 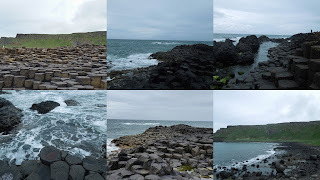 Our final stop was our favorite, The Giants Causeway, which is a natural formation of uneven rocks. Climbing these jagged steps was the highlight of the day for the girls. Although some of the rocks were slippery due to the incoming water, we all climbed to the highest point possible. Clinging to rocks, hoisting myself up, walking sideways and gripping onto taller rocks was one of my favorite experiences in Ireland. 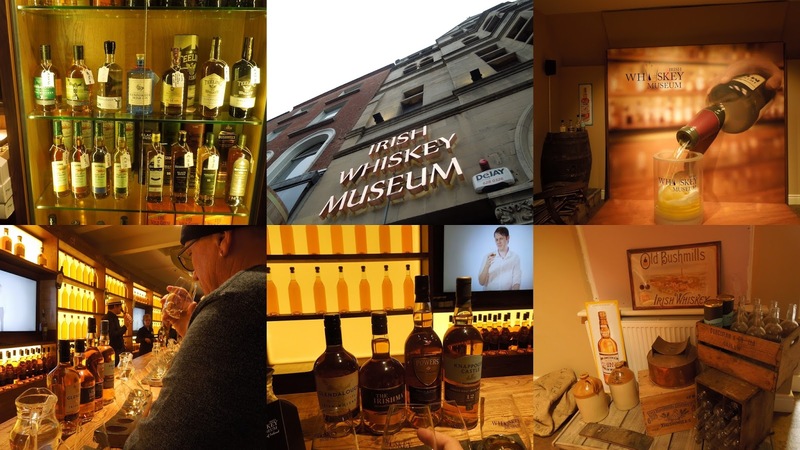 I would consider this a must-do if you are traveling to Northern Ireland. 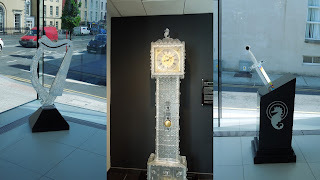 Due to the bus issue, we had only 30 minutes in Belfast’s city center, which was a shame because I really wanted to see the Albert Memorial Clock and The Big Fish. 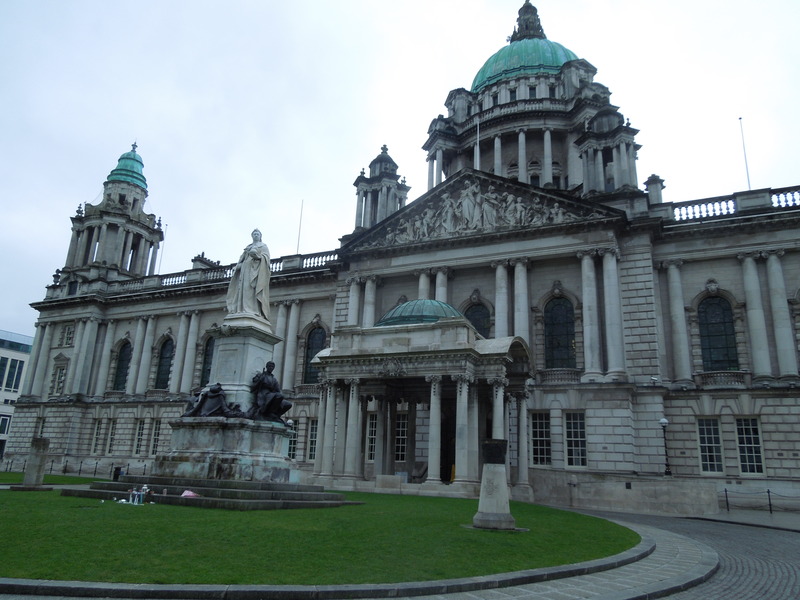 But time didn’t allow for it, so we saw City Hall and had a quick bite to eat before boarding the bus for Dublin. 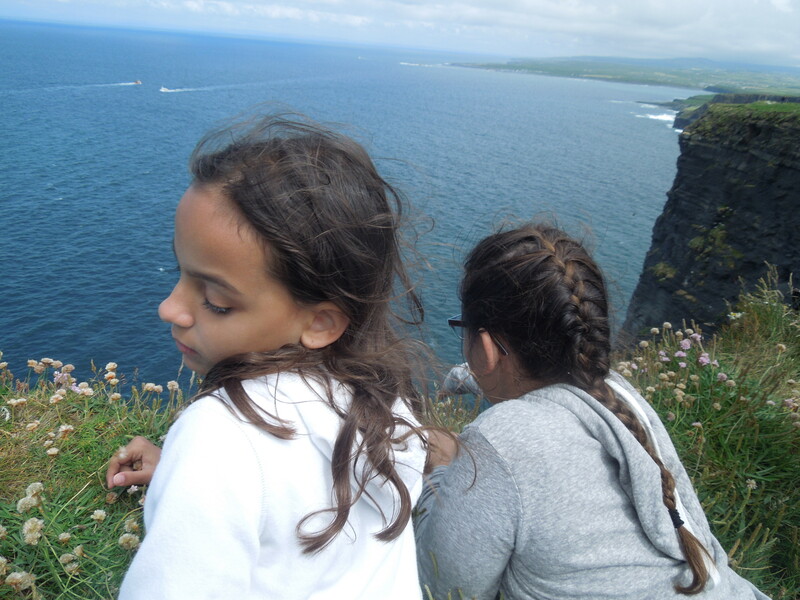 It really was a long day (7:30am-9pm) for the kids, but I am so glad we got a taste of Northern Ireland. Our last day in Ireland had something in store for each person on the trip. We started the morning with breakfast at Trinity City’s restaurant. *Tip-There are plenty of breakfast options in Dublin that are much tastier and cheaper. For 15 Euro per person, I would say it’s wise to skip the breakfast at the hotel. 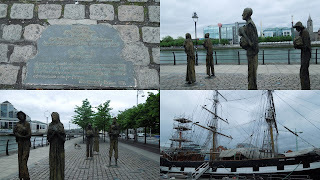 We took a leisurely walk along the River Liffey, where we visited the famine memorial, along with the Jeannie Johnston boat. The sad history of the Irish famine depicted in these statues was heart-wrenching. Luckily, our next stop -The National Leprechaun Museum-was a bit more cheerful. The museum’s tour guide was fantastic, excitedly divulging the secret tales of leprechauns, giants and fairies. The exhibits ranged from giant furniture that the kids could climb on, to a walk-through rainbow, where they could feel, see and even hear a rainbow. Everything was so much fun! 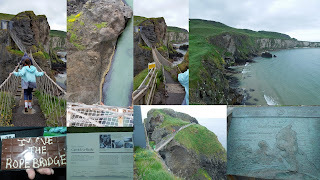 An interesting part of the tour was the walk-through of a much smaller Giants Causeway. The girls were thrilled that we saw the real thing only yesterday! I would definitely recommend this museum for families. Because we had some time to kill before our Book of Kells tour, I decided to piggyback off my husband’s idea to get some ink in Ireland. 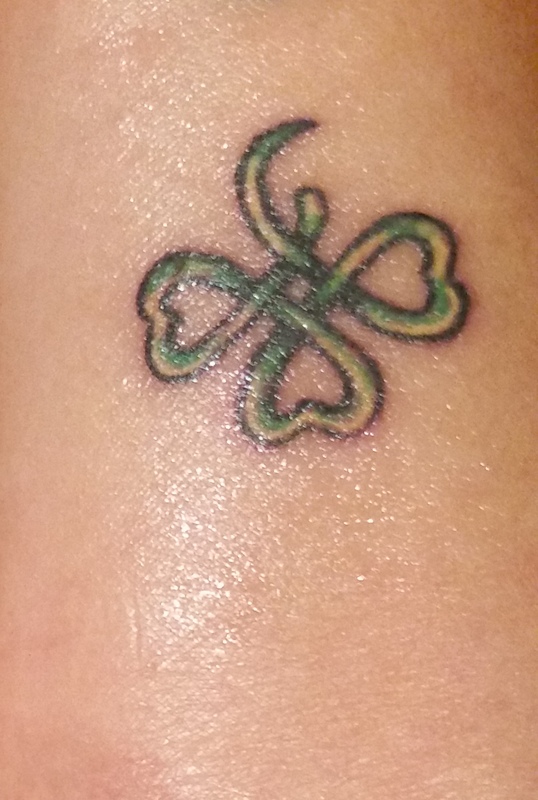 In about 15 minutes, I memorialized our trip with a small Celtic shamrock. 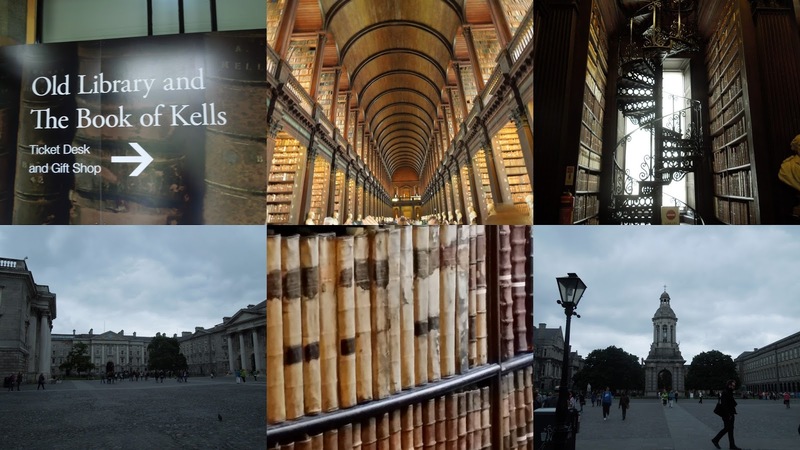 Next, was our Book of Kells and Old Library tour at Trinity College. Unfortunately, pictures aren’t allowed of the actual book, but it is definitely something to see if you have the time. Afterwards, we walked around the Trinity College campus, where my youngest decided that she might want to attend college here. After the stroll around campus, we crossed the street and took a taste-testing tour at the Irish Whiskey Museum. Don’t worry-the girls had the option of water or juice. 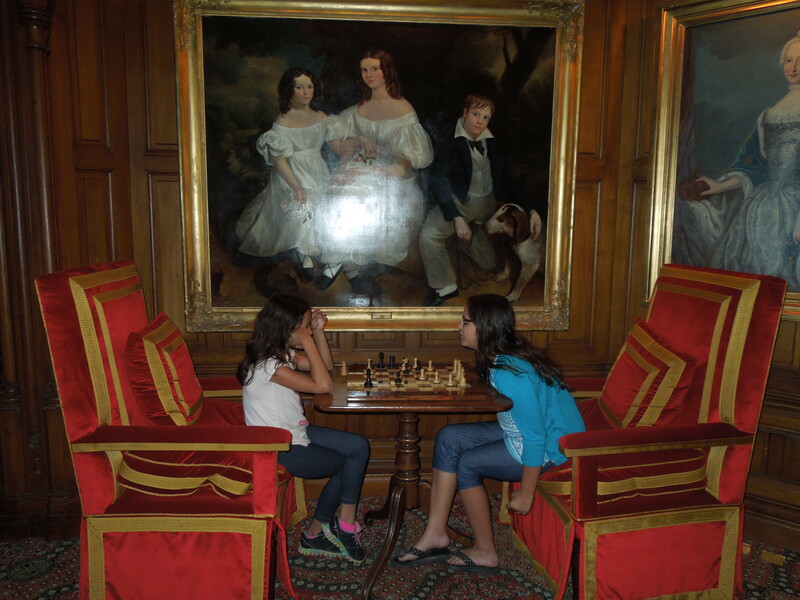 The tour was extremely informative and actually held my girls’ interests. The taste-testing part was where my girls got bored. But luckily, my husband is a whiskey lover, so the whiskey went down smooth…and quick. Our favorite whiskey was Powers and my husband even brought some back on the plane. 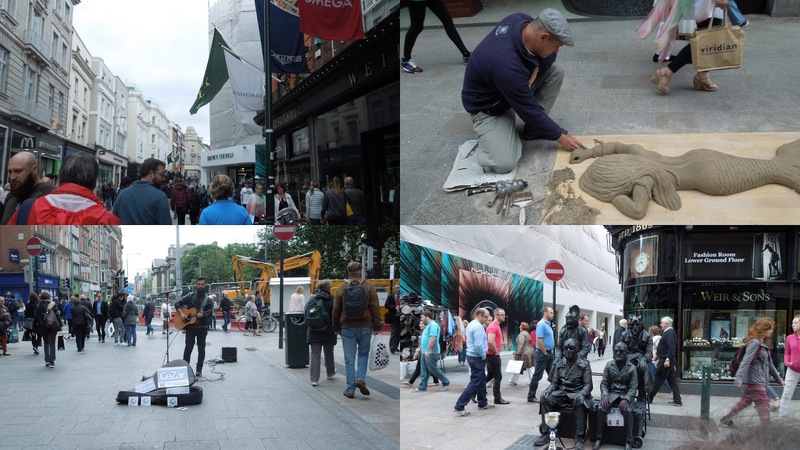 Once the tour ended, we took a stroll down the famous Grafton Street, which is a cobble stone walkway closed off from traffic with pubs, shops & street performers. One of my girls felt very strongly that we help one of the street musicians out, so we are now the proud owners of a Cezar Page CD (he actually is pretty good). After a long day, I had a strong desire to spend our last night in a pub with a pint. However, I have a very picky eater in the family, so we ended our night at the very American Fridays. We had to be at the airport by 11am, so we got breakfast at a local deli and took one last walk to O’Connell Street. I wasn’t ready to leave yet. 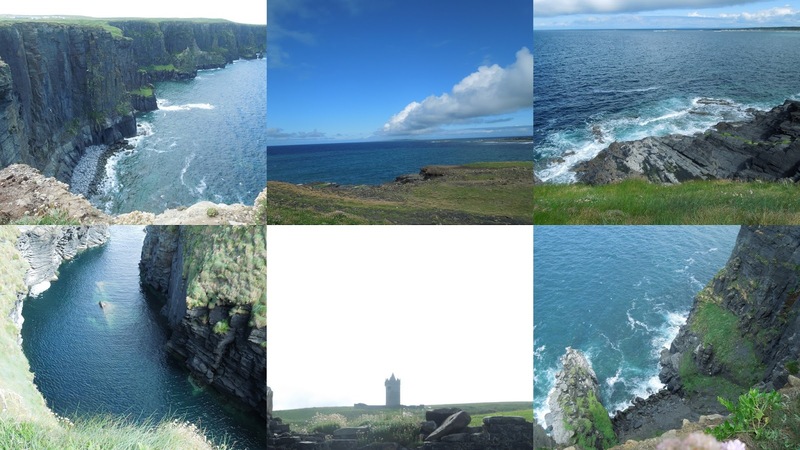 Ireland made me remember that there is something valuable in savoring beauty. In the US, we build and rebuild. Houses are on top of one another. And while a drive down I-95 will show you palm trees one moment, in the next, you can be looking at a large garbage dump. The views of our beaches are often obstructed by high rise condos. 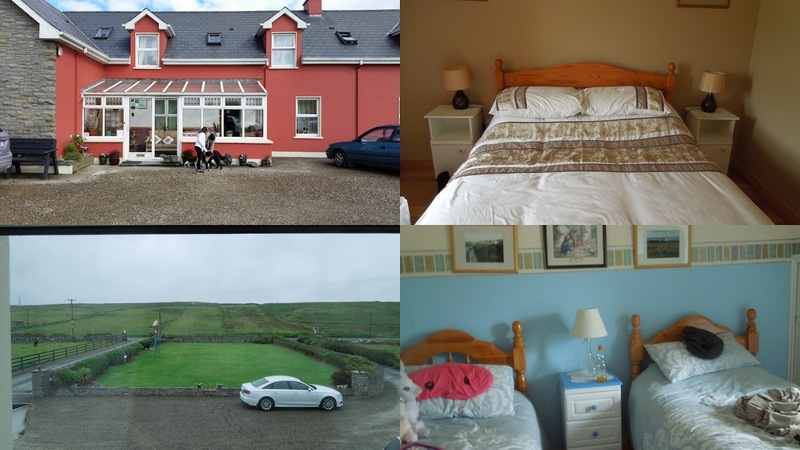 But in Ireland, homes are part of the view, as are old decrepit castles randomly scattered on your journey up the motorways. Homes fit in with the scenery instead of blocking it. 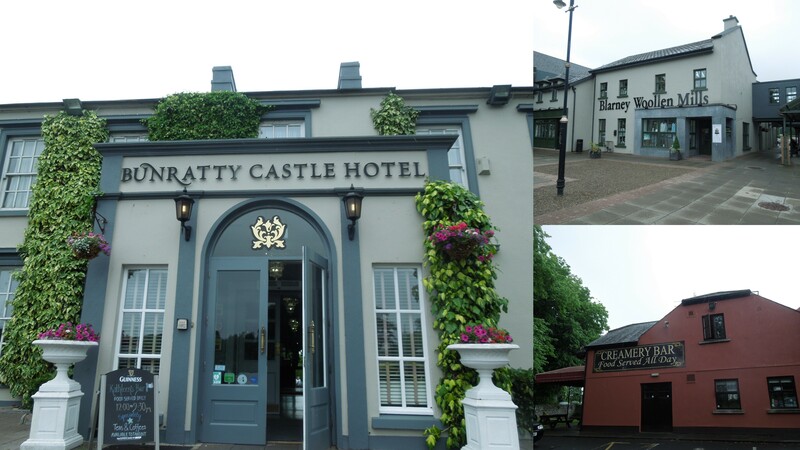 Road tripping around Ireland didn’t unveil one ugly part. 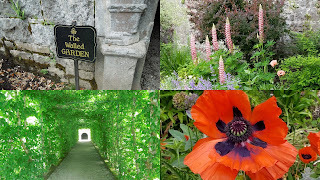 Everything was green, lovely and maintained. 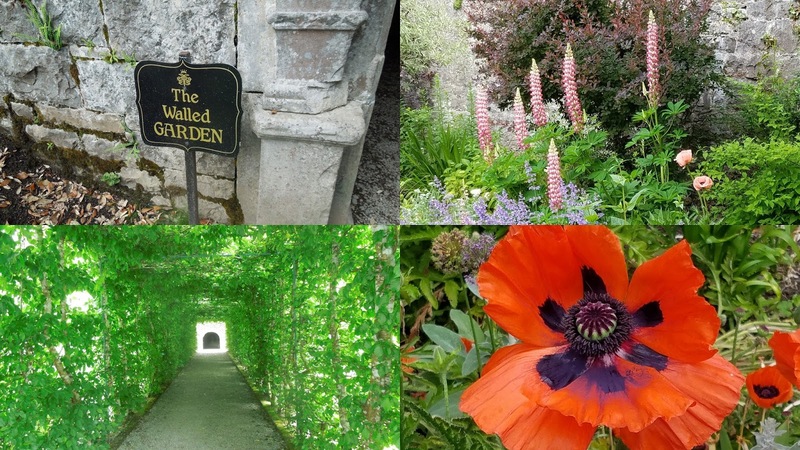 It is quite simple, yet so amazing how beauty stays beautiful in Ireland. And I’m glad our road trip showcased that beauty, allowing the girls to see our world in a slightly different light…even if only for a few weeks.